This battle was between the powers of the Pope of Rome (Germans and English forces supported the Pope) and the King of France (needed no support, after all, King of France, need I say more). 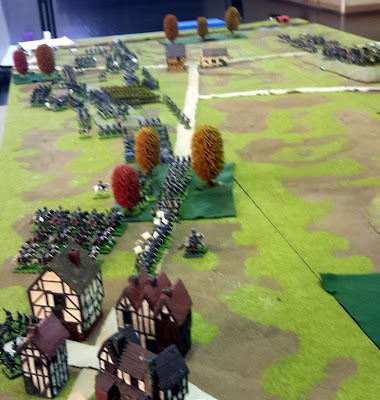 The day ended with the collapse of the Pope's Right flank and Centre (the Swiss pike in the centre died to a man even those that surrendered to the Black Legion). The French had more cannon and more cavalry but over all did not out number the Pope and his allies by much. The Black Legion was placed in the French centre opposite the Swiss Pike. The Kings Scot's Guard Archers took on the Papal Swiss Guard and won, thiss was maybe a sign to the Pope. The Pope's forces fought on and lost. Good day had by all and an early finish.